Craft - Atlanta | Bentel & Bentel Architects/Planners A.I.A. 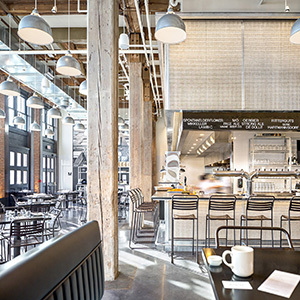 CRAFT ATLANTA, ATLANTA, GA - Tom Colicchio’s approach to cooking motivated us to experiment with a limited set of architectural materials, using the simplest and best craftsmanship required to join them. Our goal was to shape, within the tepid two-story neo-classical shell of the base building, a simple yet texturally and spatially rich interior that engages its Southern context while metaphorically manifesting the uncomplicated food and elegant service for which the chef’s restaurants have become known. Upon entering, guests encounter an open wood-fired grill clad in copper and steel that not only emphasizes the craft of cooking but also acts as a symbolic hearth for the two-story space. Past the grill on the first floor, a 3-inch thick solid walnut slab anchors the bar and provides a warm contrast to the blackened steel and glass wine vault that screens an intimate dining lounge beyond. A monumental staircase composed of continuous planks of walnut flows down from above to draw guests up to the second floor, the rooms of which overlook the activity of Peachtree Road and the courtyard of The Mansion Hotel to which the restaurant is allied. The spatial compression and release of the sequence of dining areas on this level provides varying degrees of intimacy while preserving the communal quality of a one room refectory that the chef sought. The interwoven palette of major materials on both floors – walnut, steel, copper, oak, brick, cherry, leather and muslin – create a sensuous series of spaces that evoke the character of grand Southern domestic interiors but in a distinctly modern way. All furnishings and fittings, including the cherry dining tables, walnut banquettes and sofas, and steel hardware were designed to celebrate the materials and the simple craftsmanship used to assemble them. The absence of any protective coating on the major materials of the design intentionally promotes their natural ability to age with grace.